This year I have discovered the world of PDF patterns as I have already shared with some of my sewing from FLOSSStyle when I posted about the Groovy Guys Wallet. Oh my, so many wonderful designs to choose from, such ideas to create and sew. A great advantage of a well written PDF pattern is when a designer takes the time to include photos in their instructions to show different steps in their designs. 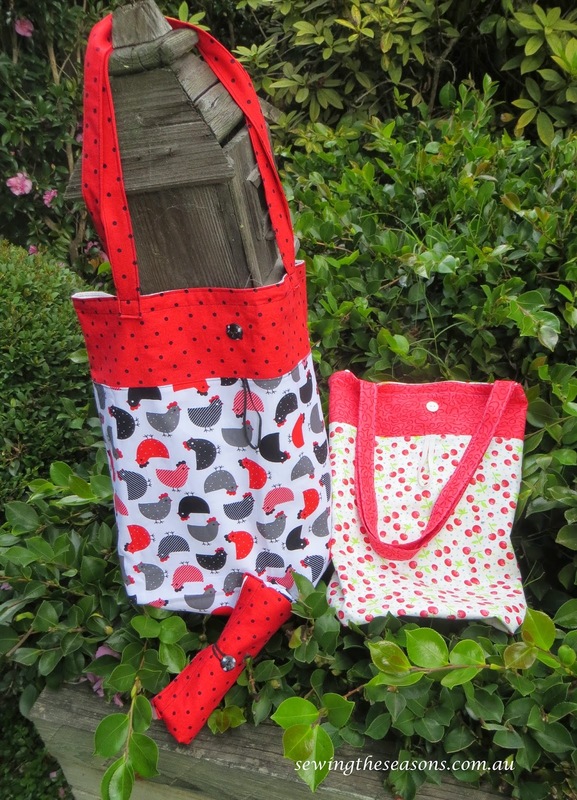 Another designer I have recently discovered is Lisa from Two Pretty Poppets who designs some wonderful bags. 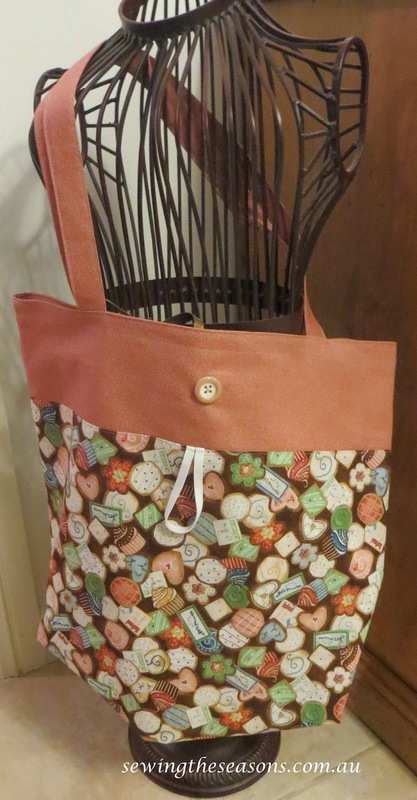 One of her patterns that I have purchased and already made is her Reuseable Grocery Bag. Lisa doesn't know I plan to write this post, I just wanted to share this wonderful discovery with you. 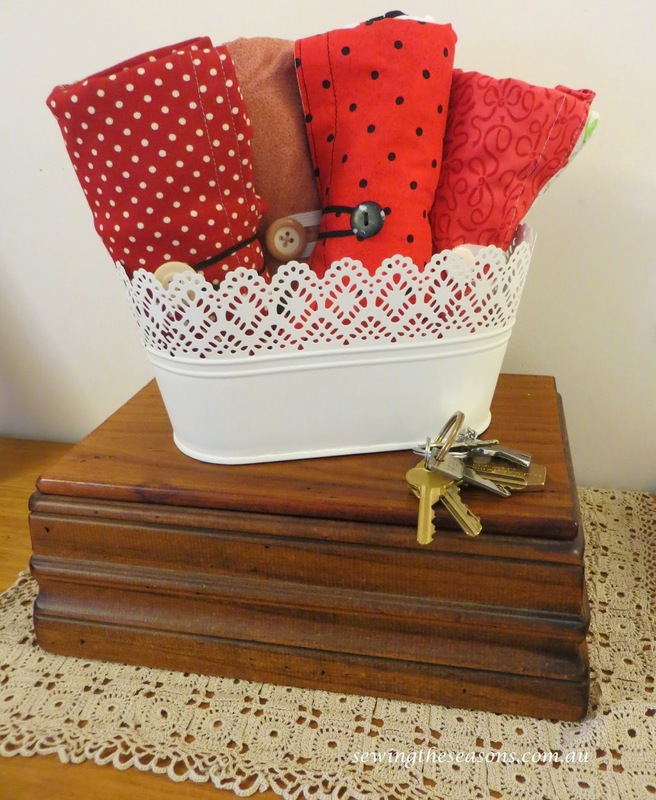 Lisa's patterns are so clearly written, with great photos tips to help in bag construction. I am in love with this pattern, and have already made half a dozen, not only to use myself but as gifts for others. The pattern has two options, lined or unlined and I have chosen to make the lined version as I feel it is stronger when using. it is an ideal pattern to make in varying fabrics, find something that suits a friend such as the chook fabric I found for Sam from Four Red Hens. I like to cut a few out at a time, bundle them up with their finishing bits ready for when I have a few moments to sew. Choosing buttons to finish the bag is lots of fun too, a small detail on the bag but something that can add that special finishing effect. Keep them together at the front door ready to grab when heading out to shop or store them in the car to have on hand at any time. This will be my go to pattern now for quick gifts. I also have a few other patterns from Lisa yet to be made up, so many great patterns, I just need more time to sew.